I’m currently testing the Fujifilm GF670 for ePHOTOzine, the review will go live in a week or so. It’s quite fascinating that Fujifilm, who’ve reduced their film range, would bring out a medium-format film camera. Medium format is more or less dead and Hasselblads, Bronicas and Mamiyas are appearing on the pages of eBay and are fetching ridiculously low prices. So a fixed lens rangefinder may not be a smart move. I’ve yet to make my mind up. It is an interesting experience though. Having not used roll film since I sold my Hasselblad 500cm six or so years ago, it was good to see that films have finally got self adhesive seals now…well Fuji Superia has at least. No longer do you have to lick to seal the strip with its foul mint flavoured gum. Now you just pull and wrap. Nice touch! 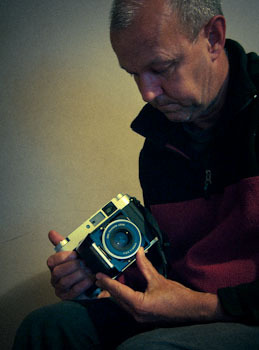 Then while using it I had to revert back to a flash meter which I’d given up on about the same time the Hasselblad went. And remembering to wind on the film! But the hardest part to cope with is not seeing the results instantly. I have the sealed roll waiting to be processed. I’ve got to decide where to send it, and then wait for the package to return. Still it’s fun going out with a camera that I can hand hold and get 6x7cm shots – even if it does look like an relic Agfa Isolette. I just hope the results are good. I’ll let you know.